Schuyler's always known she wants to be a teacher. She found her passion for teaching English because she had excellent high school literature teachers. Now in college, she's also pursuing a psychology minor. After class she's in choir and the Red Raider Athletic Band. She also serves as an admissions ambassador, tutors in the Peer Learning Center, and is a member of the RedEd Club and the Black V improv troupe. 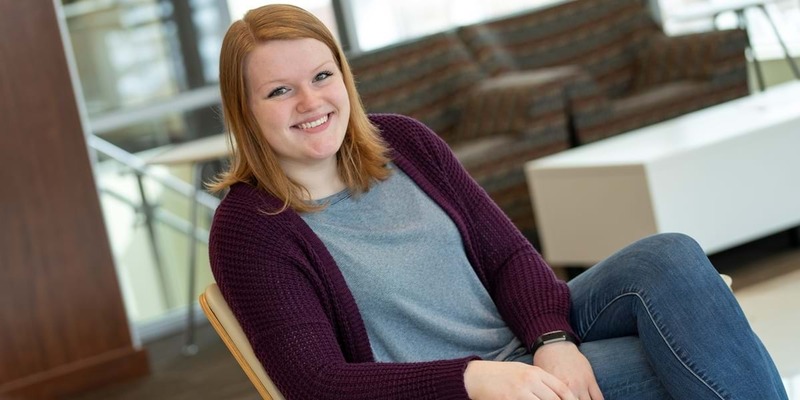 I was initially interested in Northwestern because of family members who've attended here, but I made it my choice because of the people I met when I visited and the way the Christian faith is woven so tightly into every aspect of the college. I was excited to build Christ-centered relationships and be challenged spiritually, and I knew Northwestern was the place for both. Northwestern's English professors are unlike any teachers I've had before, and the relationships I've made are filled with love and joy. They genuinely care about each student and invest in our lives, as well as work to create a really intimate classroom atmosphere. The passion they have for their work and their faith combines in the classroom to encourage a similar enthusiasm for English within their students. I've had various opportunities within the English department, such as writing tutor, Literary Contexts tutor and Writing Studio teaching assistant. These have led to professional growth as well as helped me build close relationships with the English professors and fellow English majors. Faith and learning are integrated at Northwestern, so the ideas introduced are deeper and the questions posed lead to greater understanding because we're looking at things from a Christian perspective. For example, my Shakespeare professor guided us in discovering the different ways Shakespeare's writings mirrored the Christian faith and the biblical story. It was fascinating and really helped me understand the plays on a deeper level! As a teacher, I aspire to be full of love and compassion for all students—someone they can look up to and approach with any problem they have. Whether I teach in a public or private school, I want to exude the love of Jesus and encourage my students to set high goals and work hard to achieve them. I want to be a teacher who pushes students and helps them find their passions. My favorite part of Northwestern is the relationships I've built here. The love of Christ radiates through every person on campus, and all the Christ-centered friendships I've made reflect that love and have encouraged my spiritual growth.